The appeal of Fiio’s X3 portable music player, which I reviewed a couple of months back on this site, has been boosted with the latest firmware update, adding 24-bit/192kHz asynchronous DAC funtionality. With the new firmware – FW2.05 – installed, the superb little pocket music player will not only play high-resolution files stored in its internal memory or on a microSD card, but can now connect to a computer and operate as an external DAC. Users need only select ‘DAC’ as the USB mode before connecting the cable between computer and player, and on connection will then be presented with a new screen offering a choice of DAC settings, including volume, a choice of gain settings, and bass/treble/balance adjustments. Audio can then be played out through the headphone or line outputs, while users of Fiio’s external DACs, such as the E17, will be able to use the player’s digital output to feed out an upsampled 24-bit/192kHz digital signal. Windows users will need to download drivers from Fiio’s website to enable their computers to work with the DAC function, but Mac computers will just recognise the X3 as an external USB sound device. The digital-to-analogue converter used in the X3 is the Wolfson WM8740, also found in products such as the Rega Saturn CD player, Sony’s PHA-1 DAC/headphone amp and the Astell & Kern AK100 from iRiver. The player also uses a separate amplifier chip, the AD8397 from Analog Devices, to enable it to drive even demanding headphone loads. Other functionality added to the player in the new firmware include an extension of gapless playback to a wider range of play modes, that choice of USB modes between ‘DAC’ and ‘storage’, and a formatting function to allow microSD cards inserted into the player to be erased internally if required. 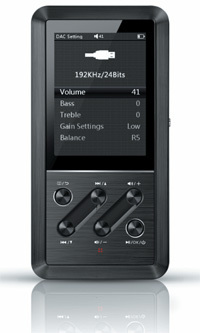 Can I update the firmware on my Fiio E17 to 24bit/192KhZ Asynchronicity via the FW2.05 update for the X-3?